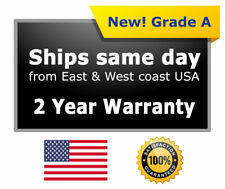 New laptop replacement black digitizer touch screen glass 13.3". This is not the actual screen. This is the glass on top of the screen that reacts to touch. Compatible Part #'s: TPAY13306S, TPAY13306S-02X, TPAY13306S-03X. Compatible Models: HP Pavilion 13-A x360 **Please check the pictures and part #'s carefully to make sure that you are ordering the correct item. There is more than 1 digitizer for the model listed. This list is for: New Dell Inspiron 15 7569 Lcd Back Cover For Touchscreen 0GCPWV USA. Compatible with: Dell Inspiron 15 7569 touch screen. Only Fit A1534 2015 Year! Can Not Fit 2016 2017! Topcase Charging hole are different. Keyboard is 100% tested with backlight, Palmrest Topcase is 96% new, clean and very good condition, very little scratch on the edge of case. Compatible with Yoga 710-15IKB 710-15ISK. Touch screen option MUST be replaced only with touch screen option. LCD screens do not develop cracks without any external force. LCD screen has thin layer of glass. NON-Touch screen option must be replaced only with NON-touch screen option. You are purchasing a brand new 15.6" touch screen assembly for Lenovo Edge 15 80H1 80K9. This screen has a 30 Pin connector with tabs on the top and bottom. The part number is N156HGE-EAL REV C1. This assembly includes the bezel. Please note: THE BEZEL WILL COME UNATTACHED.You will receive the screen part number/model listed in the title or one fully compatible with the specs listed above. LCD Touch Screen Assembly with bezel. Display Technology : LED LCD. 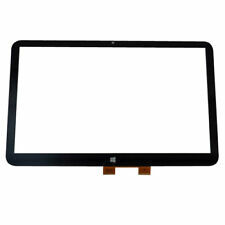 LCD Model : LP156WF5.SPA2 or compatible. Screen Size : 15.6". We will solve the problem for you. •​ Connector: 30 Pins. Connector : 30 pins. Unit may have moderate wear and scratching to the outer lid. Apple MacBook Air 13" A1466 2013 2014 2015 2017 Palmrest Keyboard & Touchpad A! Removed from an early 2015 Apple Macbook Air A1466. Grade A excellent condition used palmrest assembly. ü We log ALL serial numbers. ü Local pick-up is available. 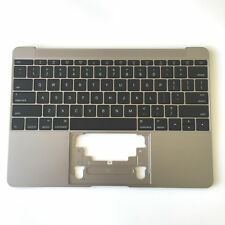 GRADE A -- Top Case/Keyboard/Palmrest - Compatible with 2013 2014 2015 2017 MacBook Air 13.3" A1466. We will review and respond to your request within 24 hours. Apple Part#: 661-7480 / 069-9397. Couple very small scratches/scuffs. ● Part Type: LCD Back Cover. ● 1x 15-BS015DX 15T-BR LCD back cover. ● Part Number : 924899-001. ● Condition: New. NEW OEM Apple MacBook Pro A1278 2012 13.3" Complete LCD Screen Assembly A1278 2012 i7 models wont fit 2011 i5 or older Macbook Pro This LCD connector is white and for the older models the LCD connector is golden color and they are compatible. Or with glued hinge cover. Ours is with hinge cover and foot, 100% new perfect. MPN: 04W3651. Model: Lenovo ThinkPad T430. 1 IBM Lenovo ThinkPad T430 Complete LCD Screen. Type: LCD Screen. Form_Factor: Laptop. Also you will find all the parts that you may need for your computer, laptop from motherboards to power supplies. New Lenovo laptop replacement keyboard. This keyboard is black in color with a red pointer. Compatible Part #'s: 00HN000, 00HN074, SN20F22600. Compatible Models: Lenovo ThinkPad E550, E550C, E555, E560, E565. 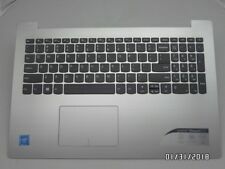 Apple Macbook Air 11" A1465 Keyboard with Top Case Battery Touch Pad and Bottom Back Cover. Pulled from a 2014 Macbook Air 11" Laptop. Keyboard is tested and works great with no problems. Fresh Pull! Fit A1534 2016 2017 only ! Can not Fit 2015, the Topcase DC Jack Charging holes are different. Keyboard is 100% tested with backlight, Palmrest Topcase is 96% new, clean and very good condition, very little scratch on the edge of case. Laptop Top Cover Palmrest Without Touchpad. HP Pavilion 15-AU 15-AW 15-AY 15T-AU Series Laptop Top Cover Palmrest Without Touchpad and Keyboard Heat Shield 856035-001. HP Pavilion 15-AU 15-AW 15-AY 15T-AU Series. Product: Macbook Pro 15" A1286 LCD Assembly. ▷Part Number: 0YJYT 00YJYT. 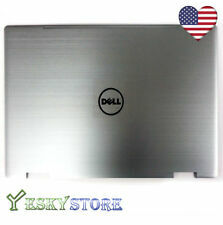 ▷Fit Dell inspiron 5558 15.6" TouchScreen series laptop. ▷Compatible Models: DELL INSPIRON 15 5000 5555 5558. ▷Does Not Fit Dell 5558 Non-TouchScreen Version. 13.3" 1080P Lenovo Yoga 720-13IKB 80X6 81C3 LCD Touch Screen Digitizer Assembly Bezel. Compatible Model:Lenovo Yoga 720-13IKB 80X6 81C3. LCD Connector:30pins Only. Interface Location: Lower Right. Doesn't work in the A1278 Macbook Pro Model. HP 1000, 2000, 2000T, 2000Z. Laptop Keyboard Skins. HP 240, 430, 431, 450, 455, 630, 635, 655. HP Pavilion G4-1000, G6-1000. The guidelines are below. Printer Parts & Supplies. Laptop Lcd Cables. Laptop Cover Parts. The Laptop Model and Layout Version. It can be used interchangeably. Hope you understand. Type: Laptop Keyboard. 1 x US Laptop Keyboard. 2x 3 RCA AV Audio Video Female to Female Jack Coupler Adapter 3RCA Connector. Diagonal Screen Size: 15.6". Images show actual product. YOU WILL RECEIVE. Apple MacBook Pro 13.3" A1278 LCD Complete Assembly. This LCD assembly is pulled from a used, tested system, and is in 100% working condition. Compatible Model Numbers: (A1278) - MC374LL/A, MC375LL/A. 605345-001-B HP PAVILION DV7-4000 SERIES BOTTOM BASE COVER "GRADE B"
605345-001-B HP PAVILION DV7-4000 SERIES BOTTOM BASE COVER "GRADE B" '' MINOR SCRATCHES""
For Apple Macbook Air A1466 (EMC 2559) (1.8 GHz/2.0 GHz) (Core i5/Core i7). with BACKLIGHT INCLUDED for APPLE MACBOOK AIR. the Laptop Model and Layout Version. It can be used interchangeably. Hope you understand. This part is tested and is in 100% working condition. No one is EVER ignored! ALL PRODUCTS ARE MARKED WITH SERIAL NUMBER AND QC BADGE. The display panel is not only thinner, but also lighter. A thinner distance from the backlight to the display surface may increase the brightness, and color reproduction of the display. Pin Connection: 40 Pins - Bottom Right. Description This is New Lenovo Y50-70 15. Compatible models: A1398 15" 2013-2014. MGXA2LL/A (Mid 2014 Core i7 2.2). Includes top case, keyboard & backlight. MGXC2LL/A (Mid 2014 Core i7 2.5). MGXG2LL/A (Mid 2014 Core i7 2.8). You will receive the screen part number/model listed in the title or one fully compatible with the specs listed above. ▷ Compati ble Models: Lenovo IdeaPad U530T U530-TouchVersion. ADD TO FAVS. ▷ You will receive what picture shows.